That's the case with each of these top pharma companies. 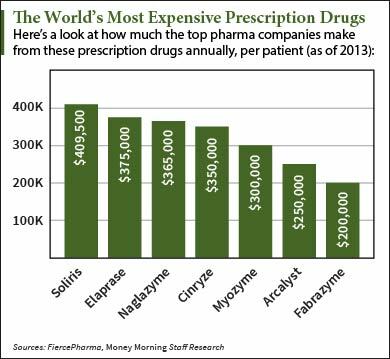 This chart shows the most expensive prescription drugs in the world. The most expensive drug, Soliris, costs patients $409,500 every year. Soliris is developed by Alexion Pharmaceuticals Inc. (Nasdaq: ALXN) and is used to treat paroxysmal nocturnal hemoglobinuria (PNH). It's a rare disease that results in the destruction of red blood cells. In 2014, sales of Soliris climbed 44% to $2.234 billion. ALXN stock is up 17.2% in the last year. The second most expensive drug is Elaprase, which is developed by Shire Plc. (Nasdaq: SHPG). The drug treats Hunter's syndrome, a genetic disorder that impacts appearance, mental development, organ function, and physical abilities. The drug costs $375,000 per patient per year. In 2014, Shire made $593 million from Elaprase alone. SHPG has gained 18.9% in 2015. Another one of the world's top pharma companies, BioMarin Pharmaceutical Inc. (Nasdaq: BMRN), makes the list with its drug, Naglazyme. It treats Maroteaux-Lamy syndrome, a metabolic disorder. Each year of treatment costs $365,000 per patient. Naglazyme brought in $334 million in 2014. That was 44% of the company's total sales. Fourth on the list is Cinryze, developed by Shire. It treats hereditary angioedema, a rare disease that creates intense swelling in different parts of the body. Shire made $503 million from Cinryze in 2014. Myozyme is an orphan drug that treats Pompe disease, a rare and often fatal neuromuscular disorder. One year of treatment on the drug costs patients up to $300,000. The drug is developed by private pharmaceutical firm Genzyme Corp.
Regeneron Pharmceuticals Inc. (Nasdaq: REGN) is another one of the top pharma companies to make the list with its drug, Arcalyst. The drug treats rare inflammatory disorders and costs $250,000 per year. Last on the list is Fabrazyme, which is used to treat Fabry disease. Patients with the disease will have fatty deposits build up in the body, causing pain and irritation. The drug is also developed by Genzyme Corp., costing $200,000 per year. This is definitely a list that no one chooses to be affiliated with, much less a parent to a child that needs one of these therapies desperately. As a parent to a child with Hunter Syndrome (it is not "Hunter's" as the article suggests), we are incredibly thankful for these life-prolonging drugs like Elaprase, but we know they do not go far enough toward alleviating the medical, financial, and other burdens of the disease. That is why as a community we are working to fund gene therapy, which is much closer to a cure for the condition, through our campaign at ProjectAlive.org. Because our kids just want to be alive when they grow up…. My son has Elaprase, which indicates in this article costs $375,000 a year per patient. Actually my sons is $38,500 a week and we have it every week. Which would be 38,500 x 52 = $2,002,000. Yes that is over 2 million dollars a year. Please go to projectalive.org to donate $1 to help us get the funding for gene therapy. Thank you!